She was ready for his steel, but not for his flesh. Luísa Tavares has a list of sins the length of the Antilles, but there’s no time to repent for them now. When a pockmarked Frenchman hands her Papa’s ring—still attached to his severed finger—she orders the Coral back to the Caribbean, despite her father’s earlier warning never to return. It’s Luísa’s luckless fate that the only man who can help her is a blasted Inglés pirate hunter who’s more dead than alive and locked in a curse he doesn’t want lifted. Worse, his feral sensuality sparks a hunger she can’t ignore. Xander Daltry hadn’t planned on kidnapping this wild woman—or succumbing to his uncontrollable desire for her. But he needs Luísa and the moonstone she wears around her neck to rescind a witch’s spell. His sister, long dead, and others like her have been cursed to remain in the mortal plane for eternity. Only the stone can set them free. Contains a pirate queen with a sacred gem, a werewolf with an agenda, an island where nothing is as it seems, and a hero with a Jolly Roger that’ll make you purr like a kitten. Do you like pirates? What about werewolves? And ghosts? Gargoyles? How would you like it if all those pirates, werewolves, ghosts, and gargoyles decided to come together into one book? Fun, right? Luisa is a young pirate in search of her missing father and when she gets information that he is on a supernatural island, she knows where she needs to go to rescue him. While on the cursed island, she gets to meet all kinds of creatures ranging from zombies to were-hyenas. In the process, she befriends a ghost, a gargoyle, and falls in love with a werewolf. But with every step she takes, trouble follows. I really don't want to give anything away so I'll stop there but believe me, you need to read this. It's a romance and an adventure story. It's full of comedy and sadness. Some scenes make you laugh and others cry. I fell in love with all the characters, from the very charming Xander, who is what every hero should be, to the adorable pet monkey. The villains were truly horrible and I hated them. One big talent that author Maria Zannini has, that is so hard to pull off, is her ability to make the reader feel. It's like all the emotions these characters experienced, the readers did too. They flowed through the page. Her writing is flawless. I've read several of Ms. Zannini's books but this one was the best, in my opinion. I really enjoyed this book and couldn't recommend it enough. I think there is a little of something for everyone and I'm sure you all will enjoy it. 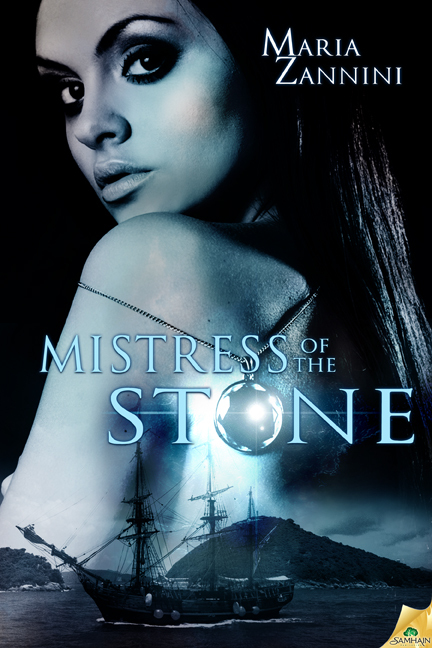 So go ahead and get yourself a copy of Mistress of the Stone today!